The aim of this study was to analyze the visiting frequency of generalist ants to plants with different surface textures of their stems. We performed an experiment in which Lasius niger ants were attracted by sweet drops to flower stems of five plant species bearing different surface structures: Alchemilla mollis (wax projections and long tread-shaped trichomes), Lilium lancifolium (without wax, with ribbon-shaped trichomes and cuticular folds), Salvia nemorosa (without wax, with trichomes of various lengths and cuticular folds), Tulipa gesneriana (wax projections, no trichomes), and Paeonia lactiflora (neither of above surface features). As control samples, dry, smooth bamboo sticks were placed in the vicinity of experimental plant stems. Using cryo scanning electron microscopy, the micromorphology of stem surfaces was examined. The present study demonstrates that, on the one hand, ants avoid climbing wax-covered stems, if trichomes are lacking. On the other hand, some trichome-bearing stems having specific trichome micromorphologies were also ignored by ants. The strongest attractiveness was revealed in glossy stems and stems covered with soft/floppy trichomes. This experiment supports the hypothesis that when exposed to a diversity of plant stems in the field, generalist ants choose substrates where their locomotion is less hampered by obstacles or slipperiness of surface. Presumably, additional locomotory efforts needed to master climbing on “greasy” or “spiny” stems lead to an increase of costs-to-benefits ratio. However, since every type of stem surface was visited at least once during the experiment, it does not automatically mean that ants are not capable of walking on such challenging surfaces. The online version of this article ( https://doi.org/10.1007/s11829-019-09681-4) contains supplementary material, which is available to authorized users. Plant surfaces have a great diversity of macro-, micro-, and nanostructures. Among others, they can be covered by trichomes of different shapes, dimensions, abundance and orientation, and by microscopic cuticular folds. Additionally, epicuticular waxes, covering cuticular surfaces of primary aerial plant organs, may appear as a flat film/layer or three-dimensional (3D) projections (Koch 2010; Koch et al. 2010). This broad range of surface features is particularly common on young stems, leaves, flowers, and fruits in a variety of higher plants (Barthlott and Ehler 1977; Barthlott and Wollenweber 1981; Barthlott 1990). Being located on the plant-aerial interface, surface micro- and nanostructures play an important role in interactions between plants and a variety of environmental factors (see reviews by Jeffree 1986; Barthlott 1990; Bargel et al. 2006). It is well known that plant surfaces can mediate insect attachment depending on the presence of trichomes, cuticular folds, 3D epicuticular waxes, or fluid coverage on their surfaces. Trichomes may either increase (Stork 1980a; Southwood 1986; Gorb and Gorb 2002; Voigt et al. 2007) or decrease (reviewed by Voigt et al. 2007) insect attachment ability. Cuticular folds may be rather neutral related to (Gorb and Gorb 2002) or hinder insect attachment (Prüm et al. 2011, 2013; Bräuer et al. 2017). 3D epicuticular waxes have been repeatedly shown to reduce the attachment ability and impede locomotion of insects (e.g., Knoll 1914; Way and Murdie 1965; Stork 1980a, 1986; Edwards 1982; Federle et al. 1997, 2000; Eigenbrode and Kabalo 1999; Eigenbrode et al. 1999a, b, 2000; Brennan and Weinbaum 2001a; Eigenbrode and Jetter 2002; Gaume et al. 2002; Gorb and Gorb 2002; Gorb et al. 2005), but the opposite effect has also been reported (Federle et al. 2000; Brennan and Weinbaum 2001b; Eigenbrode 2004). Fluid-covered surfaces make carnivorous plant cuticles slippery and strongly decrease insect attachment (Bohn and Federle 2004; Bauer et al. 2008). The protective function of specific surface coverages against herbivores has been experimentally supported for many plants belonging to various families (species of the genera Eucalyptus, Pisum, Brassica, etc.) (e.g., Anstey and Moore 1954; Edwards 1982; Stork 1986; Edwards and Wanjura 1990; Stoner 1990; Bodnaryk 1992; Eigenbrode and Espelie 1995; Eigenbrode et al. 1995; White and Eigenbrode 2000; Brennan and Weinbaum 2001a, b; Brennan et al. 2001a, b; Chang et al. 2006). Waxy stems may also be involved in the so-called “greasy pole syndrome”, preventing ants from robbing flower nectar (Kerner von Marilaun 1878; Juniper 1995; Harley 1991; Gorb and Gorb 2011). Based on field observations and experiments with Hypenia sp. (Nepetoideaea), Harley (1988, 1991) has demonstrated that ants failed to gain a foothold on waxy stems perhaps because they dislodged wax crystals and therefore fell to the ground. The stems can be also covered by stiff dense trichomes with a specific orientation (often in combination with 3D waxes), which hinder access of ants to terminally located plant reproductive organs, or prevent ants from visiting and supporting aphids that feed on the apical parts of stems (“stem guard syndrome”) (Gorb et al. 2017). The wax coverage on stems in myrmecophytic plant species of the genus Macaranga (Euphorbiaceae) was reported to serve as a selective barrier, supporting associated ants and preventing access of non-specialized generalist ant species (Federle et al. 1997). This effect was explained by the disability of generalist ants to adhere to a wax bloom. According to these data, the authors suggested a trade-off between adaptation to run on wax and to attach to a smooth surface and hypothesized the existence of the trade-offs between walking ability on waxy versus smooth stems. Recently, we demonstrated that the reason, why generalist ants do not climb wax-covered stems, is not necessarily their incapability of walking on such vertical surfaces, but rather because of a plenty of choices of other substrates (Gorb and Gorb 2011). Presumably, additional locomotory efforts are needed to master climbing on “greasy” stems, but ants need a certain time to adapt their locomotion to a new quality of the stem surface, and after this period, they can walk on these waxy stems. However, even in this situation, their locomotion remains cautious and slowed down, and presumably is rather costly from the energetic point of view. It remains unclear, to which extent generalist ants prefer particular stem quality during their foraging trips in the field situation. 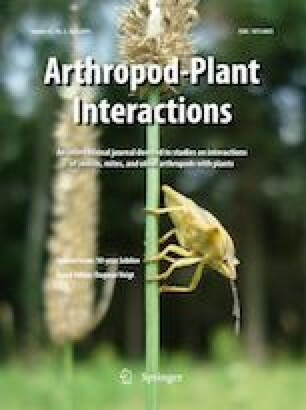 This study was carried out to analyze plant stem selectivity by ants, which are not specialized in walking on a particular plant species [in contrast to the case described by Federle et al. (1997)]. Since plant stems may either lack prominent surface features, or bear only 3D wax coverage but no trichomes or a combination of both, or have just various types of trichomes without a wax bloom, the question appears whether ants prefer particular types of the stem coverage to explore and exploit potential resources on upper portions of plants? 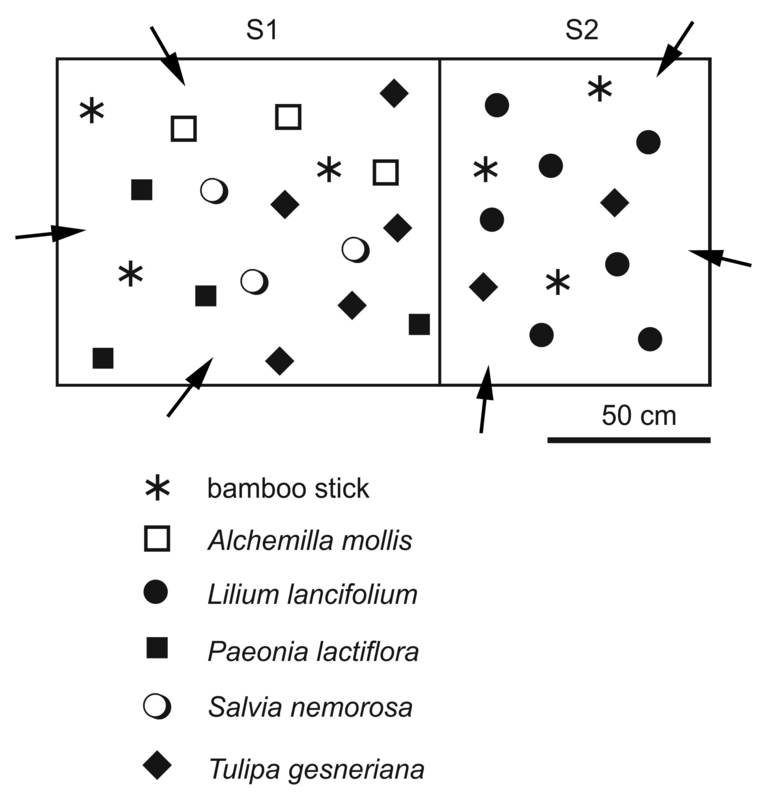 To answer this question, we designed a field experiment with Lasius niger ants to prove such an ant selectivity for flower stems (petioles and stems of inflorescences) of five common garden plant species having different micro- and nanostructures of the stem surface: Alchemilla mollis, Lilium lancifolium, Paeonia lactiflora, Salvia nemorosa, and Tulipa gesneriana. Using cryo scanning electron microscopy, the surface micro- and nanotopography of plant stems was quantitatively examined. The principal idea of this study was to test a dependence of ant exploratory/foraging activity depending on the stem surface and to discuss the relevance of plant surface features to both the plant and ant biology. Varieties/cultivars of five plant species with flower stems having a range of surface textures (Fig. 1a–e) were chosen for this study. The garden lady’s-mantle Alchemilla mollis (Buser) Rothm. (Rosaceae) is an herbaceous perennial plant, which is native to southern Europe, Anatolia, the Caucasus, and Iran, but nowadays is grown throughout the world as an ornamental garden plant (Kurtto et al. 2009). A. mollis ‘Auslese’ reaches 30–45 cm in height; long-stalked fan-shaped palmately veined leaves have scalloped and serrated edges. Above the foliage, small green-yellowish flowers are densely clustered on branching flower stems bearing small sessile fan-shaped leaves. The tiger lily Lilium lancifolium Thunb. (syn. L. tigrinum Ker Gawl.) (Liliaceae) is an Asian species, native to China, Japan, Korea, and the Russian Far East (Czerepanov 1995). It is widely planted as an ornamental and has become naturalized in numerous locations in eastern North America. In L. lancifolium ‘Splendens’, erect stems (80–100 cm high) bear numerous sessile linear leaves and are terminated by flowers. The Chinese peony or common garden peony Paeonia lactiflora Pall. (Paeoniaceae) is an herbaceous perennial plant, native to central and eastern Asia (Czerepanov 1995). It is the parent of most modern varieties, which are used as bloomers and for the cut flower business. P. lactiflora ‘Alexandre Dumas’ grows up to 90 cm tall and bears 9-lobed 20–40 cm long leaves. Cup- or bowl-shaped flowers of ca. 15 cm diameter with pink petals are placed either separately or in small groups on long flower stems with sparsely distributed, relatively small simple leaves. The woodland sage or Balkan clary Salvia nemorosa L. (Lamiaceae) is an herbaceous perennial plant native to central Europe and Western Asia (Govaerts 2003). There are numerous cultivars commercially grown. S. nemorosa ‘Caradonna’ plant has numerous leafy stems, which grow from the base and are covered by trichomes and sessile glands. Inflorescences bear closely spaced whorls of small flowers. The Didier’s tulip or garden tulip Tulipa gesneriana L. (Liliaceae) is cultivated as an ornamental in many countries; most of the tulip cultivated forms are derived from this species. Its region of origin is not entirely certain: the species is believed to have originated in Turkey (Czerepanov 1995). It has become naturalized in central and southern Europe as well as in North America. In T. gesneriana ‘Flaming purissima’, the tall (up to 70 cm high) stem bears lanceolate or broadly lanceolate leaves and a single flower. The experiment was carried out in a private garden (Kronshagen, Schleswig–Holstein, Germany; 54°20′11.354″N, 10°5′15.547″E). Plant samples for electron microscopy were taken from the same site. The black garden ant Lasius niger L. (Hymenoptera, Formicidae) was selected as a model generalist ant species because (1) it is associated with many plant species including those studied here (personal observations) and (2) it was available in a great number at the study site. This omnivorous species originated from South America and both southern and northern regions of Africa (Klotz 2008). Recently, it has spread over Europe and become widely distributed at sites of human disturbance (roadsides, gardens, etc.). Workers of this ant species regularly forage on diverse plants (Hölldobler and Wilson 1990). They can rob nectar from flowering plants and collect honeydew from aphids living on plants. Attachment system of this ant species bearing paired claws and a pad-like arolium on each foot was previously described in detail by Gorb and Gorb (2011). Surfaces of plant flower stems and dry, commercially obtained bamboo sticks were examined using cryo scanning electron microscopy (SEM). Small samples (1 cm long) from the middle part of the stems were cut out from living plants, immediately mechanically attached to a small vice on a metal holder and frozen in a cryo stage preparation chamber at − 140 °C (Gatan ALTO 2500 cryo preparation system, Gatan Inc., Abingdon, UK). Frozen samples were sputter-coated with gold–palladium (thickness 6 nm) and studied in the frozen condition in a cryo SEM Hitachi S-4800 (Hitachi High-Technologies Corporation, Tokyo, Japan) at 3 kV accelerating voltage and − 120 °C temperature. Description of trichomes was performed in the main according to Voigt et al. (2007). Types of wax projections were identified according to the classification of plant epicuticular waxes proposed by Barthlott et al. (1998). Morphometrical variables and densities of trichomes, wax projections, and other surface structures were measured from digital images using SigmaScan Pro 5 software (SPSS Inc., Chicago, USA). These data are presented in the text as mean ± SD for n = 10. We selected 3–7 individual flowering stems (one stem per one plant) having 3–5 mm in diameter of five plant species growing at the same area (2 m2) in the garden at a distance of about 20–50 cm from each other (Fig. S1). Additionally, six dry smooth bamboo sticks (Tonkinstäbe, Schlegel & Co. Gartenprodukte GmbH, Riedlingen; Fig. 1f) with approximately the same diameter and 30 cm long were vertically deposited at a distance of 15–40 cm from the plant stems. In the plants studied, the flower(s)/inflorescence(s) were cut off at a flower stem height of ca. 20–30 cm. After 24 h of recovery and drying out of the wound, the experiment was started. This approach allowed us a direct comparison of control samples (bamboo sticks) and experimental plant flower stems located at a very narrow space and therefore exposed to approximately the same number of foraging ants. A small droplet (ca. 15 µl) of the customly prepared sugar syrup (double-distilled water to sugar weight ratio was 1:1) was deposited on the sample tip (Fig. 1f). After 5–8 h, each single stem was individually checked, and the number of ants, feeding on the syrup drop, was recorded. After counting ants, the droplets were renewed. The experiment was carried out during 7 dry days (168 h) in May–June (May, 28 till June, 5) at a temperature of 18–26 °C and 60–85% relative humidity, in the period, when all experimental plant species were blossoming or just before/after flowering. This allowed a comparison of plant species at approximately the same phenological stage. In all, 17 visits of experimenters to each single sample were made and visits of 207 ants were recorded. Our zero-hypothesis was that the frequency of visits should be similar for all sample types (plant species and control) studied. Data on plant structures are presented in the text as a mean value ± standard deviation. To determine whether there is a significant difference between the expected frequencies and the observed frequencies of ant visits in different sample types (five plant species and control), numbers of ant visits per sample type were tested using Chi square test (software Good Calculator, free online calculators). Pairwise multiple comparisons between sample types were performed using Chi square test with Bonferroni correction (α = 0.05/15 = 0.003). For each test, the expected frequencies in each sample type were calculated as expected = total number of ants/total number of stems × number of stems of this sample type. 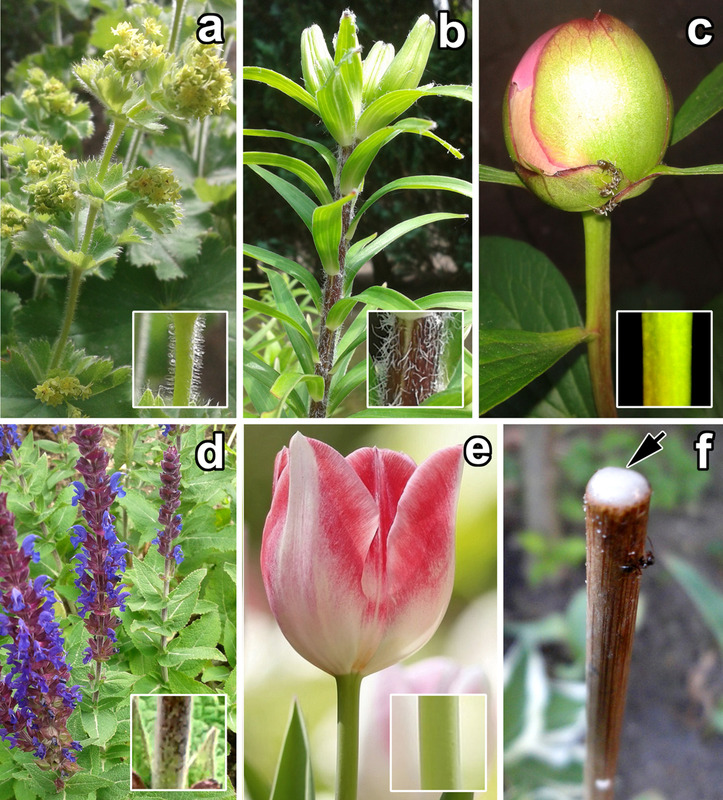 Five plant species studied show different surface structures on their flower stems. A. mollis bears a dense coverage composed of both trichomes and 3D waxes. Here, there are two types of non-branched trichomes having relatively smooth surface. Densely (ca. 58 mm−2) and regularly situated thread-shaped, long (length: 0.94 ± 0.10 mm) and thin (diameter in the middle of the trichome: 13.69 ± 1.84 µm), bent non-glandular trichomes are responsible for the soft wooly surface appearance (Fig. 2a, b). Additionally, much smaller (total length: 58.92 ± 12.58 µm) glandular trichomes with short stalks and spherical heads (length ratio stalk to head is ca. 1:1) are regularly distributed in lower number (ca. 12 mm−2) between the latter ones (Fig. 2b). Wax projections (Fig. 2c) are highly interconnected, extremely thin (thickness: 0.04 ± 0.01 µm) membraneous platelets with numerous extensions having different irregular shapes. They protrude from the surfaces at acute angles, show no specific orientation and completely cover the flower stem surface. In L. lancifolium, non-branched, long and flat ribbon-shaped non-glandular trichomes (length: 2.09 ± 1.66 mm; width: 56.71 ± 7.01 µm; thickness: 1.82 ± 0.39 µm; density ca. 6 mm−2) are highly twisted (Fig. 2d). They compose a rather uniform soft felt-like hairy coverage. Trichome surface is uneven, rugose, or with scale-like irregularities (Fig. 2e). Between non-glandular trichomes, relatively small (total length: 81.21 ± 14.05 µm) glandular trichomes (Fig. 2d) with short stalks and spherical/ellipsoid heads (length ratio stalk to head is ca. 1:1) are very sparsely distributed (density ca. 0.3 mm−2). The stem surface underneath the indumentum is noticeably ribbed, bears scattered rounded protrusions (diameter: 40.72 ± 5.76 µm; density ca. 8 mm−2) and is additionally densely sculptured with regular cuticular folds (width: 3.01 ± 0.10 µm) running parallel along the stem axis (Fig. 2d–f). The stem surface of P. lactiflora is formed by slightly convex shape of epidermal cells (Fig. 2g). The cells bear non-specific irregularly scattered, microscopic, flat scale-shaped surface irregularities (Fig. 2h). Salvia nemorosa possesses a very prominent indumentum (Fig. 3a) composed of numerous (density ca. 120 mm−2) relatively small (length: 0.29 ± 0.28 mm, base diameter: 18.66 ± 10.75 µm), squarrose non-glandular trichomes. These trichomes are non-branched, cone-shaped and of greatly variable size, from rather short (ca. 200 µm) to much longer (ca. 1.2 mm) ones (Fig. 3b). They are irregularly distributed over the surface: smaller ones more densely and longer ones more sparsely. Trichome surface bears a very noticeable sculpturing due to plentiful microscopic (diameter: 1.18 ± 0.19 µm; density ca. 0.2 µm−2), hemispherical or -elipsoid protrusions (Fig. 3c). Also small (total length: 44.31 ± 4.10 µm) glandular trichomes (Fig. 3b) with short stalks and spherical/elipsoid heads (length ratio stalk to head ranges from ca. 1:1 to ca. 1.5:1) occur on the stem surface (density ca. 20 mm−2). The surface underneath the hairy coverage bears striking, parallel running cuticular folds (width: 0.91 ± 0.21 µm) (Fig. 3c). In T. gesneriana, a distinctly furrowed surface (ridge width: 17.95 ± 3.44 µm) (Fig. 3d) is almost completely and rather uniformly covered by 3D wax projections (Fig. 3e). The projections represent a transitional form between very long polygonal, spirally coiled rodlets (width: 0.08 ± 0.02 µm, thickness: 0.02 ± 0.01 µm) and slender tubules (length: 0.68 ± 1.17 µm, outer diameter: 0.11 ± 0.01 µm, inner diameter: 0.06 ± 0.01 µm) (Fig. 3c). Surface of bamboo sticks used as a control is smooth, being slightly uneven at high magnifications because of non-specific surface irregularities having various shapes and dimensions (Fig. 2i). Data on number of ant individuals visiting each sample during experimental time (17 recordings per sample) are presented in Supplementary Table S1. As seen from the table, at least one reference bamboo stick was visited by ant(s) during every recording. Here, the lowest number of positive (with visiting ants) recordings per sample was five (index Bs1 at S1), whereas the highest number reached 14 (index Bs3 at S1). Maximum seven ant individuals visited the bamboo sample at the same time. In the case of P. lactiflora, nine insects were once registered on one flower stem sample. Contrary, ants were never detected on five (of totally seven) flower stems of T. gesneriana and two (of totally three) flower stems of S. nemorosa. All other plants samples, inclusive other flower stems of T. gesneriana and S. nemorosa, were visited by ants from one to up to seven times. These were 1–4 ant individuals at the same time. Figure 4 displays the cumulative number of registered ant individuals for each sample type and averaged number of ant individuals per sample for each sample type (total number of all ants visited all samples of this sample type during the whole experimental time divided by the number of samples). Ants showed significantly different preferences (χ2 = 167.0907, d.f. = 5, P < 0.001). Most visited samples were control bamboo sticks, which differed significantly from all plant stem sample types studied (P < 0.001 for all comparisons, Chi square test with Bonferroni correction; Table 1). Among plant samples (χ2 = 49.3530, d.f. = 4, P < 0.001), two groups of species were distinguished: (1) P. lactiflora and L. lancifolium with high number of ant visits and (2) S. nemorosa and T. gesneriana with low number of ant visits. These groups differed significantly from each other (P < 0.003, Chi square test with Bonferroni correction; Table 1), whereas no differences were found between species within the groups (P > 0.003, Chi square test with Bonferroni correction; Table 1). Stems of A. mollis showed intermediate number of ant visits and did not differ from other four plant species (P > 0.003 for all comparisons, Chi square test with Bonferroni correction; Table 1). Flower stems of five plant species studied showed a great variety of surface textures. Whereas stems of P. lactiflora, although being slightly uneven, had no prominent surface protrusions, the furrowed stem surface of T. gesneriana beared a dense coverage composed of microscopic wax projections. Other plants displayed combinations of microscopic surfaces structures (3D waxes in A. mollis or cuticular folds in L. lancifolium and S. nemorosa) with a striking indumentum. The latter was formed in the main by relatively long non-glandular trichomes, which appeared to be either soft/floppy in A. mollis and L. lancifolium or rigid in S. nemorosa. 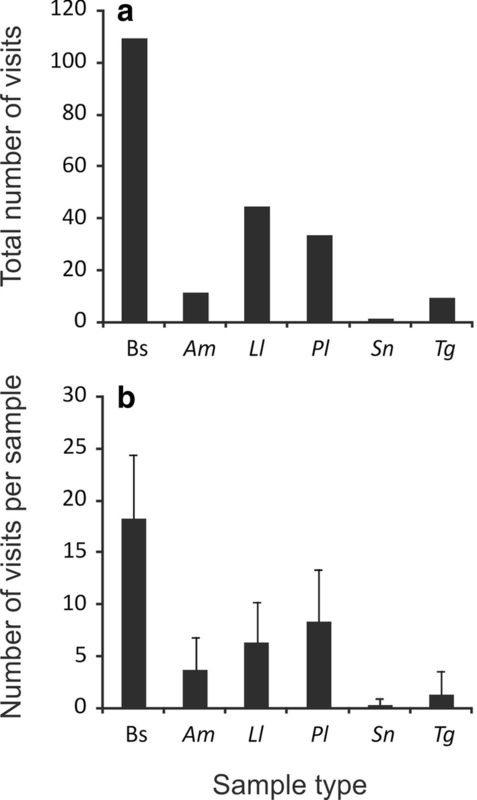 Workers of the generalist ant species L. niger exploring and foraging at the study site showed clear preferences for certain stem sample types. They quickly detected and most frequently visited smooth bamboo sticks used as a control. High visiting frequency observed in this case may be primarily explained by a suitable quality of this sample type surface allowing successful attachment. The ability of L. niger ants to hold and move on smooth stem surfaces has been previously reported (Gorb and Gorb 2011). It was found for Anethum graveolens L. (Apiaceae), Dahlia pinnata Cav. (Asteraceae), and Tagetes patula L. (Asteraceae) plants that after stems were wiped and epicuticular wax coverages were removed, ants readily walked there. Also force measurements in a number of other non-specialized ant species have demonstrated that on a smooth test substrate, ants were able to achieve strong attachment forces considerably exceeding their body weights (Federle et al. 2000). These data are in line with previously reported results on many other insects, bearing different attachment pads, which showed reliable attachment abilities on a variety of smooth artificial and natural substrates (e.g., Stork 1980b; Edwards 1982; Gorb and Gorb 2002; Gorb et al. 2010). Among plant species tested, relatively smooth flower stems of P. lactiflora were ones of the most preferable, but still they were lesser visited by ants compared to bamboo sticks. We suppose that somewhat uneven surface topography caused by slightly convex shape of epidermal cells and also non-specific surface irregularities might be responsible for the latter effect. In literature (Prüm et al. 2012; Bräuer et al. 2017; Voigt et al. 2018), convex cells have been attributed to the enhancement of insect attachment force also on hierarchically structured plant surfaces (with superimposed wax projections or folds). However, the influence of solely epidermal cell curvature (convex, concave) on insect attachment has not been systematically studied so far. In contrast, pruinose flower stems of T. gesneriana with prominent microstructured wax surface was one of the mostly avoided by ants. 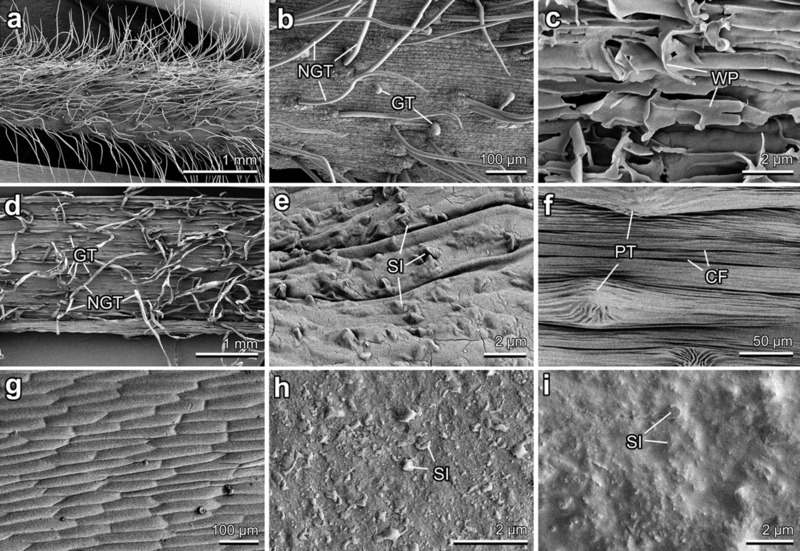 According to a great number of previous experimental studies with many insect and plant species [reviewed by Gorb and Gorb (2017)], 3D epicuticular wax coverages usually reduce insect attachment using different mechanisms such as reduction of real contact area, contamination of insect adhesive organs, adsorption of fluid from insect pads, hydroplaning, and formation of separation layer (Gorb and Gorb 2002; Gorb et al. 2014). However, the study with L. niger ants and wax-bearing stems of A. graveolens, D. pinnata, and T. patula has shown that ants were able to walk on such anti-adhesive vertical substrates, when they had no other choice (Gorb and Gorb 2011). It has been concluded that the reason why non-specialized ants usually do not climb wax-covered stems is that the additional locomotory efforts are needed to master climbing on “greasy” stems. In the present study, ants ignored the stem samples of T. gesneriana, since they had four more different choices of other plants offering sugar syrup and having more suitable surfaces for climbing. The fact that we still registered few ant visits to these sample type indicates that ant can hold and walk on such a surface. This finding supports the results of the previous study (Gorb and Gorb 2011). Also in A. mollis, the flower stem surface had 3D epicuticular wax coverage, but it was additionally combined with trichomes. This stem type showed the intermediate number of ant visits compared to other plant species. We assume that in this case, the possible effect of wax projections, which usually reduce insect attachment, was minimized by the presence of trichomes. Dense pubescence composed of long (and presumably floppy) trichomes probably provided appropriate sites for ants’ foothold. Successful attachment/locomotion on hairy + waxy plant surfaces has been also previously registered in experimental studies with other plant and insect species, e.g., Chrysolina fastuosa beetle on the adaxial leaf surface of Robinia pseudoacacia (Gorb and Gorb 2011), Dicyphus errans bug on both leaf sides of Gerbera jamsonii and the abaxial leaf surface of Malus domestica (Voigt et al. 2007), Nezara viridula bug on the adaxial leaf surfaces of Phaseolus vulgaris and Oryza sativa and on both leaf sides of Glycine max (Voigt et al. 2018; Salerno et al. 2018). In the case of L. lancifolium flower stems, where long soft trichomes were combined with another kind of surface microstructures—cuticular folds, we detected high number of ant visits. Although the folds have been earlier hypothesized to favor attachment and locomotion of insects having in view flowers and pollinators (Stork 1980b; Barthlott and Ehler 1977), later experiments based on leaf and petal surfaces clearly demonstrated a great decrease of insect attachment force on the cuticular folds on flat substrates due to the reduction of the real contact area (Prüm et al. 2011, 2013; Voigt et al. 2012; Bräuer et al. 2017). In the present study, we registered relatively high (intermediate between the highest and the lowest observed) frequency of ant visits to this stem type. It is very probably that like in A. mollis, soft twisted trichomes “compensated” for an unsuitable quality of the stem surface caused here by the cuticular folds. For another plant species, S. nemorosa, having the flower stems also covered by both the cuticular folds and trichomes, we obtained drastically different result. Here, the visiting frequency by ants was one of the lowest among all sample types studied: only one ant individual was once seen on one (from totally three) stem samples. We explain this by a combined effect of the cuticular folds diminishing attachment ability of ants and stiff and rigid trichomes. These trichomes having distinctly microsculptured surface and being very variable in size and orientation, formed rather irregular, “unpredictable” topography of the stem surface, which could not provide a foothold for climbing ants. The impact of plant trichomes on herbivores and other phytophages, where trichomes act as physical barriers, is widely presented in literature [see review by Voigt et al. (2007)]. Similar effect is recently suggested for rigid and dense hairy coverages on plant stems that presumably hamper the access of ants to aphid colonies feeding on the apical parts of stems (Gorb et al. 2017). For ants, most of which rely on the food sources located on plants, reliable locomotion is only possible through the presence of elaborate adhesive systems (Wojtusiak et al. 1995; Federle et al. 2000, 2002; Orivel et al. 2001; Gladun and Gorb 2007). However, often experiments on insect adhesion ability are performed under controlled lab condition. In the present study, we examined the plant surface texture effect on the real behavior of ants and revealed that almost every kind of surface structures (trichomes, 3D waxes, cuticular folds) influences the visiting frequency. We clearly demonstrated that the access to the food source on the tip of the flower stem was impacted by the stem surface structures. Even though we could well explain observed effects by the geometrical features of plant surfaces, we could not completely exclude possible supplementary effects of the surface chemistry due to the presence of glandular trichomes.